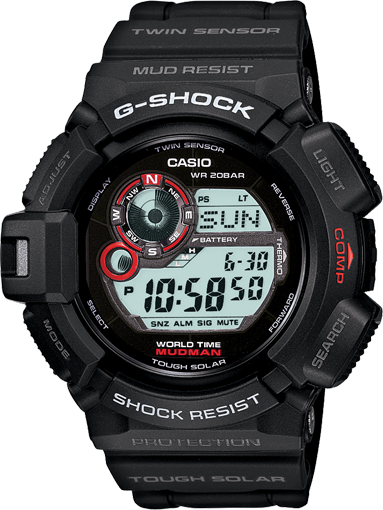 The different models in the G Shock Mudman Series are G Shock Mudman G9300, and the G Shock Mudman 3031 comes with a cool light-on-dark display to match the overall theme.This remarkable series is inspired by military watches and incorporates stylish design with durability and reliability. All the models in this series are matte black with black ion plated buttons to convey a feeling of stealth and prestige. 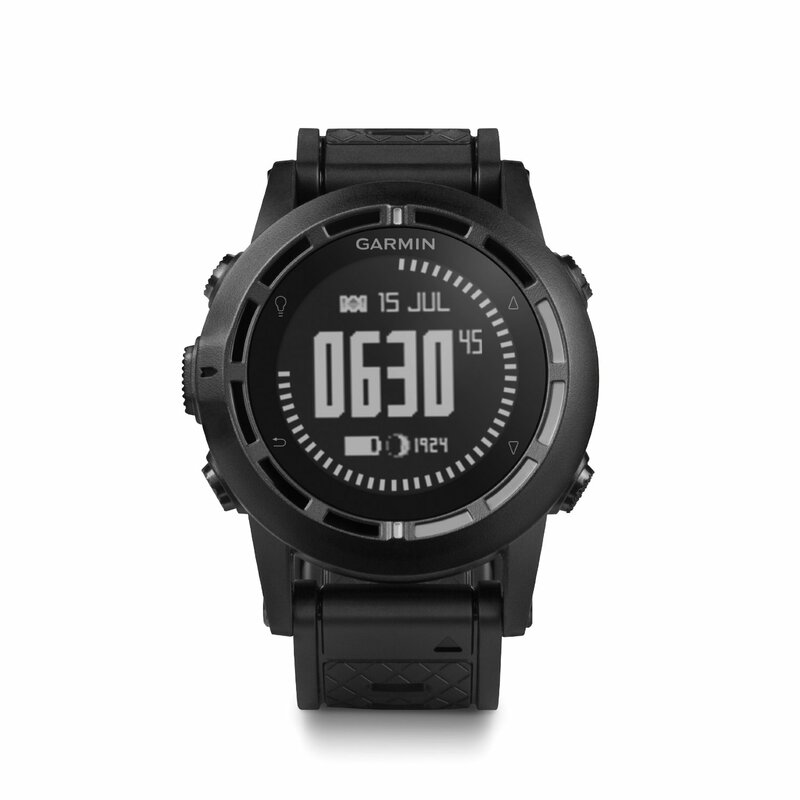 The primary purpose of a watch like this is to be able to keep time when your training includes harsh weather. 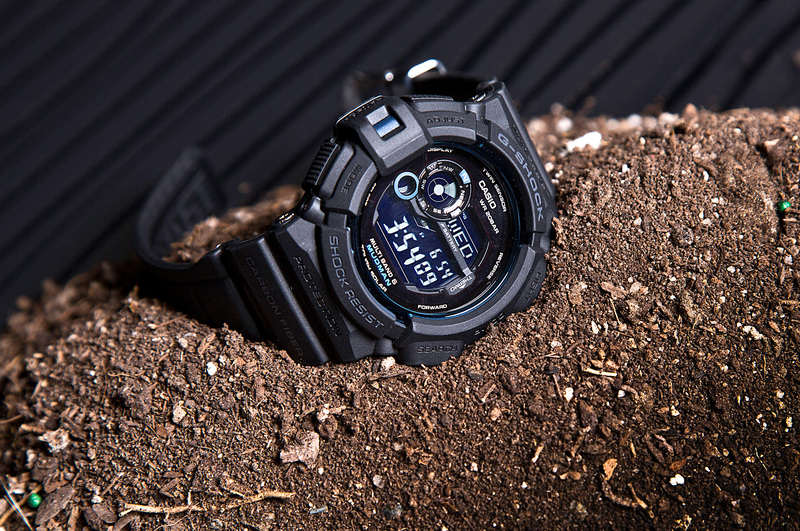 You will not have to worry about the watch’s ability to perform in rain, mud, dust or the cold, just your own. This series has been designed from the ground up to be tough to ensure that it survives harsh environmental conditions. 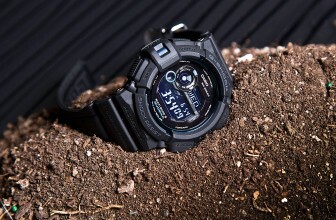 Not only are the new Series of Mudman watches resistant to dust, mud, and water, they keep time with atomic timekeeping and are powered by their Tough Solar Power system. This combination of features gives you unparalleled timekeeping with its Multi-Band 5 atomic radio which can be programmed to calibrate to various atomic clocks up to six times a day. When paired with tough and sturdy solar power connected to a battery that can run up to 9 months without a charge, you have a watch you can truly rely on to give you accurate time, every time. The impressive new design conveys its strength and resilience with a strong yet sleek black resin case. For the limited time, it is also available in the bright rally inspired red. 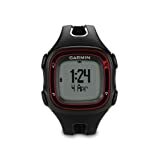 Being made the outdoor environment, this watch comes with numerous features which are designed to help to boost your performance. These features will aid in maximizing the joy in the outdoor adventures and progress your training. 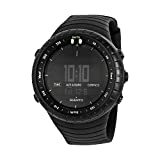 To better highlight the features that these watches offer, let us walk you through the different situations you will benefit from owning a Mudman watch. To start is comes equipped with a stopwatch with an accuracy to 1/100 of a second and has the capacity to time up to 60 minutes. 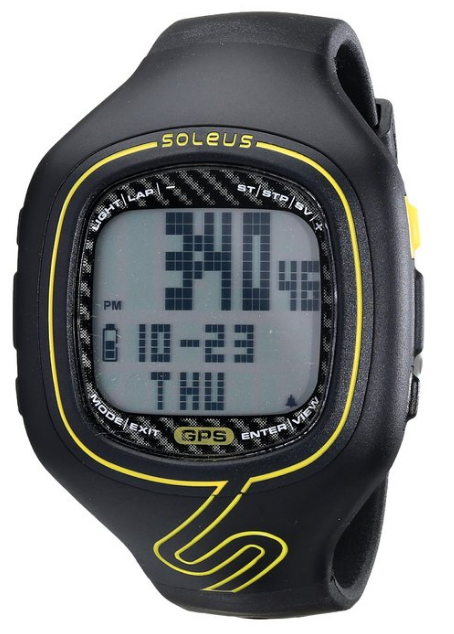 Not only this, the stopwatch feature is complemented by a countdown function that has an incredible range of up to 24 hours. To further add to the value, you can set up to 4 daily alarms plus one snooze alarm to ensure that you don’t miss anything. 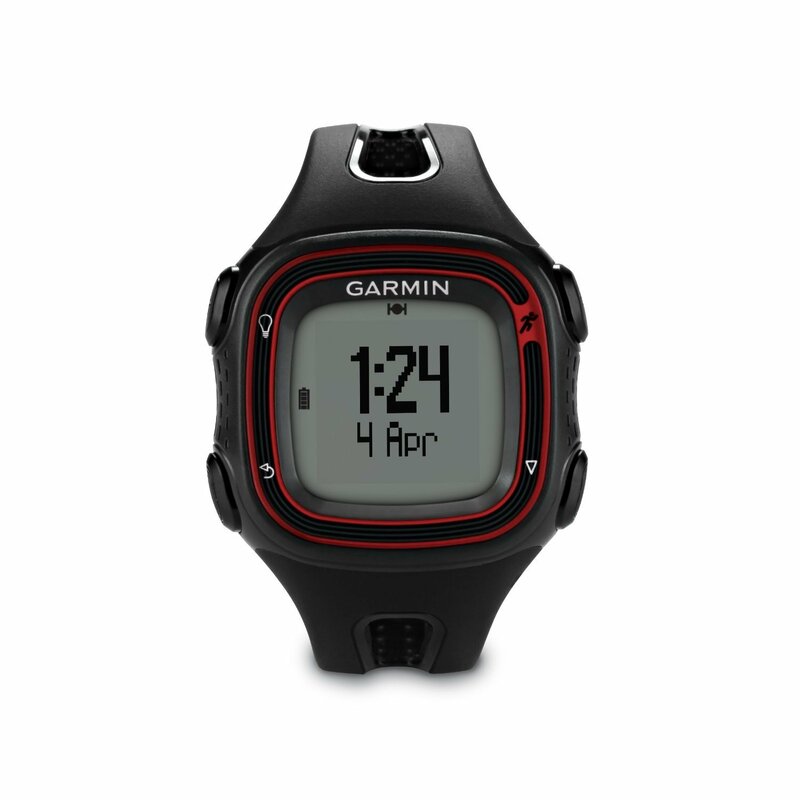 It also offers a valuable feature that will update you on the time in 1-hour intervals. Looking deeper into the features, it has a super hard mineral crystal face which is resistant to scratches and shock. The impressive looking AfterGlow LED electro-luminescent backlight allows you easily read the face when the external lighting conditions are poor. It is also water resistant for up to 200 meters (660 feet) in depth to include our deep diving friends and rain lovers alike. 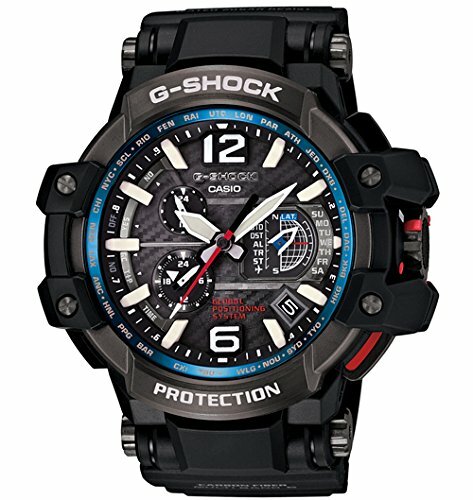 In addition to powering the watch, the acclaimed tough solar power system also powers a digital thermometer and compass. These are invaluable tools to people adventuring in the outdoors or the city. If you are someone who is interested in moon phases and cycles than you will definitely want to take a look at moon tracking function. Also includes 12 and 24 hour format time option and button mute function. 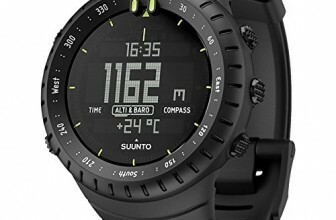 It can tell you the time of 48 cities worldwide along with the UTC information. The product boasts a rating of 4.6 out of 5 in 140 customer reviews, which reflects the sense of satisfaction and in the consumer base.People are satisfied with their purchase and claim it to be solid, stylish and well worth the price. Moreover, the band and watch are noted as being extremely comfortable to wear. Along with the overwhelmingly positive reviews, there are some people that claim that there are major flaws in parts and it that the worth of this watch is less than the price suggested. In addition to these claims some say that it is difficult to operate, but never fear, manuals are posted online and a paper copy should be packed with the product. In spite of these reports, there is a much larger number of people who not only enjoy the Mudman watches but swear by them. This is a remarkably strong and functionally advanced product with a vast, satisfied customer base that will swear to its durability. For a military diver or anybody planning on spending any prolonged amount of time underwater, there are certain characteristics that are indispensable features in no matter the level of quality. Water Resistance:- Lower end models offer a depth rating around 100m and that is plenty for most people. Higher end models claim 300m and often have warranties guaranteeing strength and operation at those depths. Durability:- The durability of these watches outside of their ability to withstand pressure will always be above that of your standard watch, but even heavyweights aren’t created equal. Economical watches will be made of hard plastic and glass and may show signs of aging more quickly as standard glass faces and plastic will scratch much more easily than the new and amazing synthetic sapphire or hardened mineral crystal faces may offer. Another aspect to be noted is its resistance to changes in temperature. A watch in freezing water may behave differently depending on the quality of its parts and engineering. With so many small moving parts, if you are relying on the accuracy of the watch in an icy situation, you will want to spend the extra money on something you are going to be confident in. Materials:- Examine and the sort of materials the watch made from. Wearing a watch with a plastic band is going to feel different than one made of silicone or rubber. 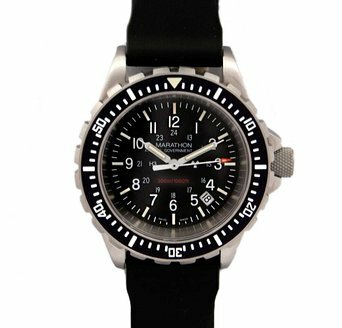 When shopping you will notice some will include a metal band so you can dress the watch up and take it out after your dive. The bodies range from stainless steel to plastic to engineered carbon reinforced polymers. You will get unparalleled strength from stainless steel but on the other hand, a plastic body will be lighter and you may find it more comfortable. Bonus Features:- Some of the perks and technical revolutions include Tritium tubes built to provide 25 years of continuous illumination without draining power from the battery. Many of these watches will have hands or number painted with Marine-Glo paint, which will last for a few hours after being exposed to light. 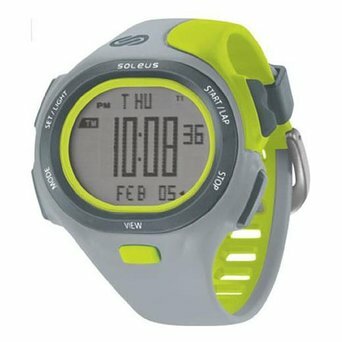 Backlit watches will use your battery but will always be lit brightly enough to see. 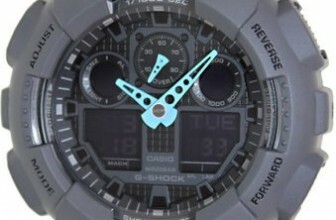 Some watches even offer inverted backlight modes for less light in stealth situations or sheer style preference. 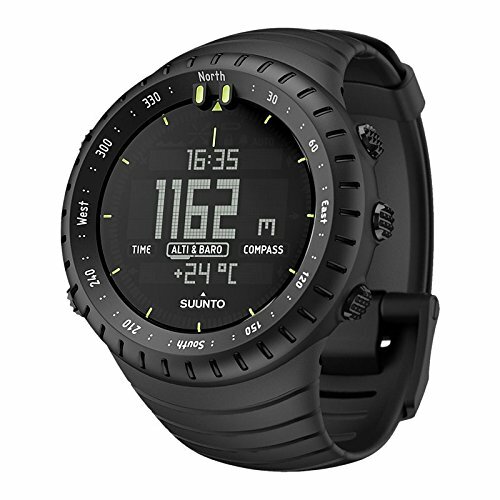 Other watches may include extremely useful features such as a compass or depth meter or have a face that has anti-glare properties for easier reading. 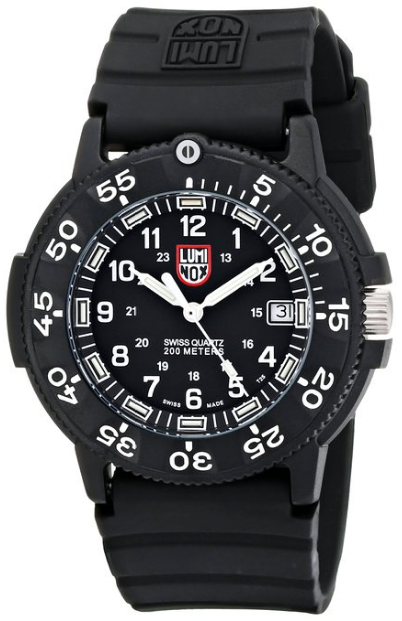 Luminox is a well-respected company known for their dive watches specifically. American made for the Navy SEALs, it is an extremely well made and good looking watch that will cost a bit of money, but is incredibly economical considering the life and quality you will receive. 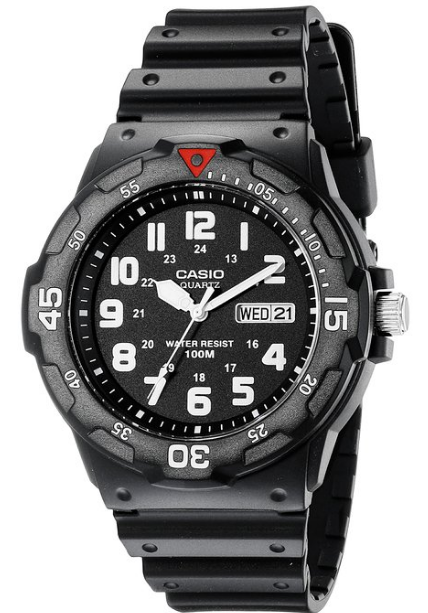 This handsome watch is a great entry level diving watch. 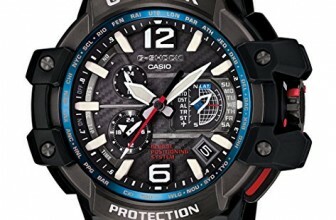 It is economically priced and offers most of the quality you will get from a much more expensive watch. This watch is one of the best money can buy. It offers the latest cutting-edge technology in its material and design. This is a lot of watches but the high price tag is not arbitrary. 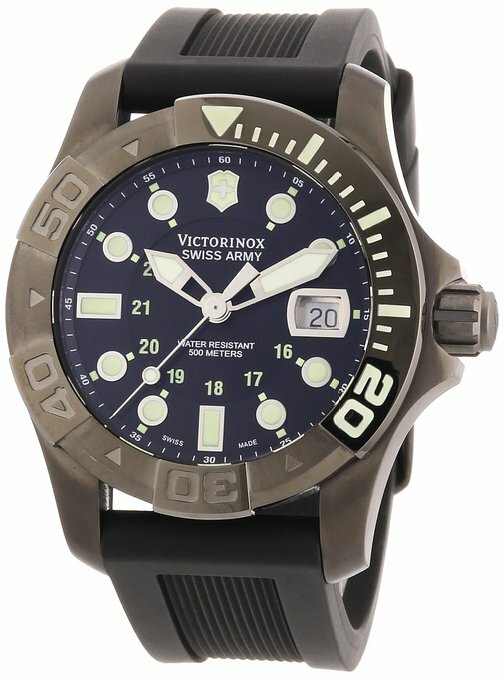 You are truly looking at one of the best watches in production and is used by the Swiss Army. Lit with 16 luminescent tritium tubes guaranteed to stay lit for 25 years! 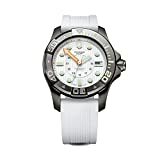 This watch is extremely stylish and durable. 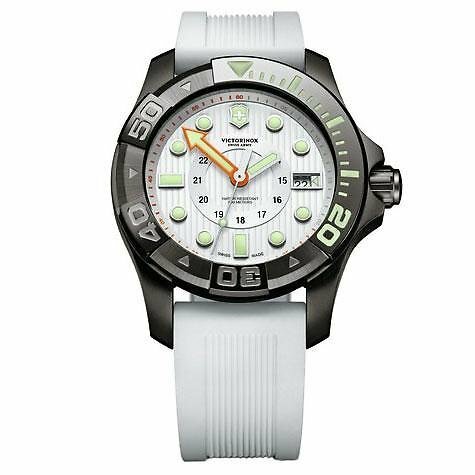 It is one of the deepest diving watches and offers a competitive price in the world of high-end watches. This watch is boldly styled and great quality for the price you pay. As a middle range watch, you can get the quality you can trust at a great value. With its stainless steel PVD (physical vapor disposition) it is strong an d will look great for years. Black PVD stainless steel case with a white rubber strap. Uni-directional rotating black PVD bezel. 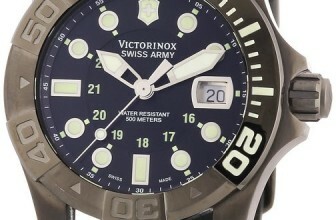 White dial with luminous hands and index hour markers. 24 hour markers. Minute markers around the outer rim. Dial Type: Analog. Luminescent hands and markers. Date display at the 3 o'clock position. Quartz movement. Scratch resistant sapphire crystal. Screw down crown. Solid case back. Case diameter: 38 mm. Case thickness: 13 mm. Round case shape. Band width: 19 mm. Band length: 7 inches. Tang clasp. Water resistant at 500 meters / 1650 feet. Functions: date,24 hour, hour, minute, second. 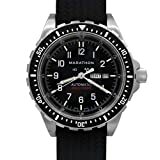 With all these different military watches being able to tell time with similar accuracy, you really just have to assess your needs and budget and be sure the watch you choose will go as deep as you will and have a look you will love for years.